The 6.0 version of the Stats Tracker for Hockey Coaches will be released by the end of July. We have added additional player and team statistics including tracking blocked shots, and missed shots that enable the Corsi, Fenwick statistics. We have also include IGP, IAP, and IPP along with some advanced charting. Determining plus/minus is a bit more complicated than adding goals scored while a player is on the ice and subtracting goals allowed while a player is on the ice. The +/- statistic measures an individual players contribution to a team’s success on the ice. A player is counted with a +1 when his team scores (even strength or short-handed) and that player is on the ice. The player is credited even if there is no direct involvement in the scoring play. A player is credited with a -1 when the player’s team gives up a goal when the player is on the ice. Teams on a power play have an automatic advantage, therefore, power-play goals do not count into plus/minus calculation. A player who scores one power-play goal in a 1-0 victory has a plus/minus of zero for the game. Players are not charged with a -1 when allowing a goal on the power play. When a short-handed goal is scored, all players on the ice for the scoring team are credited with a +1 and all players on the power-play team are charged a -1. It is possible for a player to receive an assist and not receive a “+”. The player could have made a pass, left the ice on a line change and then a goal was scored. +/- Rank No Skater Rank based on +/-. The highest +/- value will get a Rank of 1. BLK Yes Skater Blocked shots. In defensive play when a skater blocks an opponent’s shot. BS% Yes Skater Blocked Shot for Percentage. The percentage of all shot attempts for that are blocked. BF Yes Skater Blocked Shot For. An offensive shot attempt that is blocked. IA No Skater Individual Assist. If a player received an assist on a goal. IAP Yes Skater Individual Assist Percentage. Percentage of goals scored when the player was on the ice when the player had an assist. IG No Skater Individual Goal. Equivalent to G.
IGP Yes Skater Individual Goal Percentage. Percentage of goals scored when the player was on the ice when the player scored a goal. IP No Skater Individual Point: If a player received an assist or if the player scored the goal. IPP No Skater Individual Point Percentage: Percentage of goals scored when the player was on the ice when the player had a goal or an assist on. 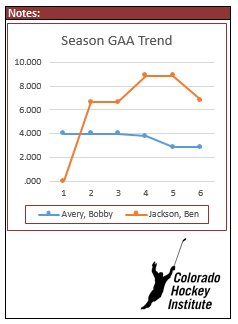 IPPP Yes Skater Individual Primary Point Percentage: Percentage of goals scored when the player was on the ice when the player had a goal or primary assist on. MG% Yes Skater Missed Goal Percent For: Percentage of all offensive shots taken that missed the opponent’s goal. MA Yes Skater Shots Missed the Goal Against: Opponents shot attempt that misses the goal. MF Yes Skater Shots Missed the Goal For: Offensive shot attempt that misses the opponent’s goal. OG% Yes Skater Shots on Goal Percentage For: Percentage of all offensive shot attempts that were on the opponent’s goal. PPG No Player Power Play Goal. SA Yes Skater Shot on Goal Against: Opponents shot on goal. Shots on opponent’s goal. Shot must be able to score if the goaltender was not there. Shots that hit the post, are not considered shots on net. TA Yes Skater Take-aways. Count one for a player when they gain possession from the opponents. TO Yes Player Turnovers. Counted when a player turns the puck over to an opponent (for example with a bad pass. considered a turnover. It is loss of puck possession without an opponent causing the lost possession. counted against a goaltenders save percentage or GAA. GA No Goaltender Goals against. – Empty net goals do not count towards a goaltender’s goals against. – Goals scored during a shootout do not count towards a goaltender’s goals against. GAA No Goaltender Goals-against average. Empty net, penalty shot goals do not count as shots or goals against. L No Goaltender Loss: A goaltender receives a loss if he is on the ice when the opposing team scores the game-winning goal. If two goaltenders combine for a shutout, neither receives credit for the shutout. Instead it is recorded as a team shutout. If a regular season game is tied 0-0 at the end of overtime, if one goaltender played the game then that goaltender is credited with a shutout, regardless of how many goals are scored in the shootout. Do not count empty net goals as a shot on goal. T No Goaltender Ties: A goaltender receives a tie if he is on the ice when the game-tying goal is scored. W No Goaltender Wins: A goaltender receives a win if he is on the ice when his team scores the game-winning goal. As hockey coaches we are always trying to determine what players would make the best line combinations in certain game situations. Decisions may be made on this from some statistics, or just a gut feel. To help resolve this for coaches, we have enhanced the Hockey Stats Tracker for Excel to give you this capability in just a few clicks. 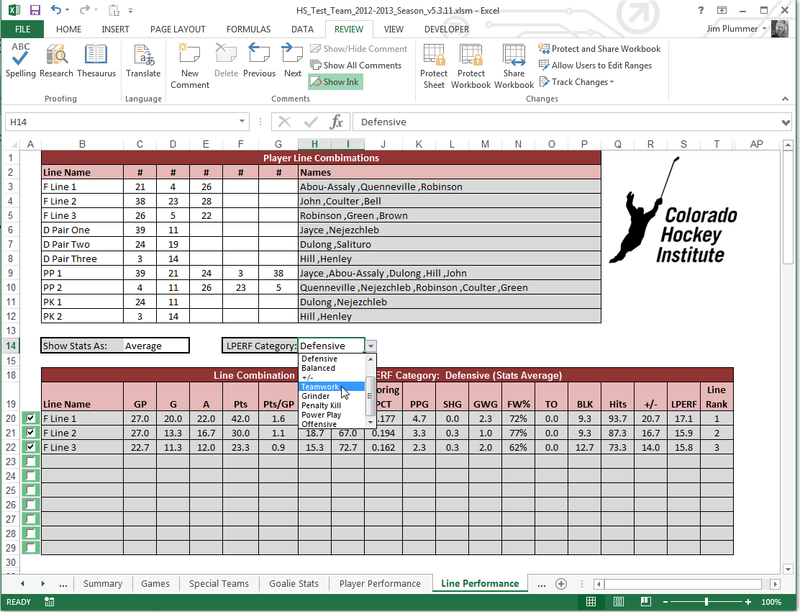 Whether you have just a few games recorded or an entire season, you can create your own line performance categories based on your own combination and weighting of 11 of the most relevant hockey stats. Check out this video that shows you how easy this task has become for the coaches that record their season stats in the hockey Stats Tracker program. Keep those questions and enhancement ideas coming! The definition of GAA is to average the goals per min and then multiply by 60, so that it is a comparable average to a standard 60 minute game. This way you can compare your goaltender performance to other goaltenders (such as college, NHL, or whatever). 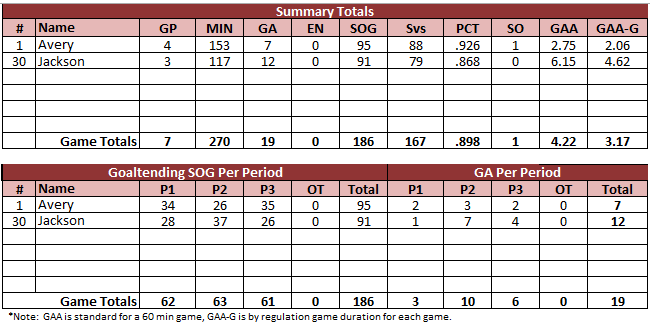 I know my players like it when then can compare their GAA vs. the top NHL goaltenders, etc. What some ask for is really a goals per 45 min game average, which would only make sense to compare against goaltenders that play the same duration of games. To answer the concern is that a goaltender only lets in 2 goals during a 45 minute game and ends up with a 2.677 GAA for that game. That is basically how it works. Had that goaltender played an official 60 minute game, it is likely on average that would be the number of goals that would be allowed. Things can be further complicated when teams go to tournaments and play 3x 10 min stop time or any variation. This calculation is the same as ERA for pitchers – if a pitcher has 1 earned run and only pitches 1 inning, the ERA is 9. For comparing many performance indicators in hockey, school, and any number of examples we use the percentage. Percent is parts per 100. For a younger child in school we don’t try to color results by justifying 7 out of 8 on a test score (which is 100*(7/8) = 87.5 percent) as being 70 perocto (which is 80*(7/8)) – that just would not make sense because it is not a common way of looking at school test scores, (even though they are young kids and they never see tests with 100 questions on them, they are usually only 80 questions). My point is that it will be more useful to stick to standards. Also, keep in mind that GAA is just one statistic. There are many areas of performance that should be considered to measure a goalies performance, such as rebounds allowed, save percentage for differing shots and from differing ice locations. If the GAA number is concerning, focus on Save Percentage. That can’t be misinterpreted and is more representative as the goaltender’s individual performance. 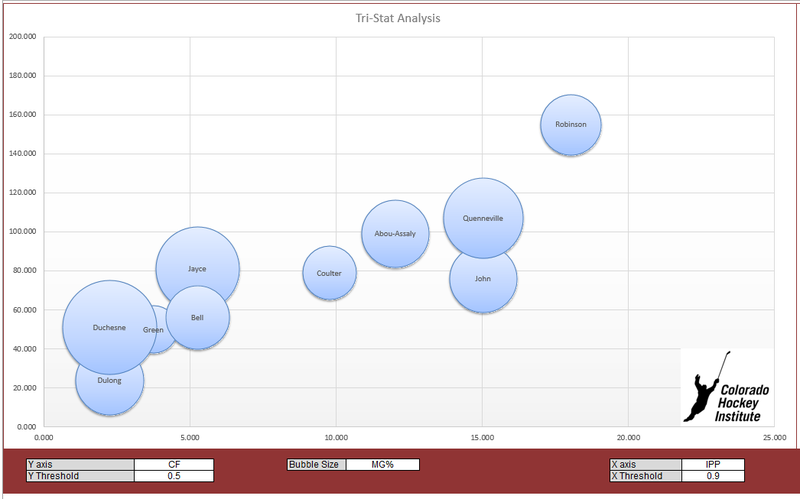 With that being said, we have released a new product for advanced goalie statistics and analytics. Within that product we do provide the standard GAA for a 60 minute game, and the GAA-G based on regulation duration of each game (which can vary). It is a more complex calculation and really becomes a large weighted average across all games of varying length, but it provides one more piece of information to consider. Above all, statistics are not an answer, but information to help you think about performance. What is good, what can improve, and what is that stat telling us? The focus in our hockey stats products is to capture as much data as possible and provide it in forms for you to analyze and interpret easily. For example, our Goalie Analytics product for Microsoft Excel provides goaltender performance visualization by using the magic quadrant presentation. 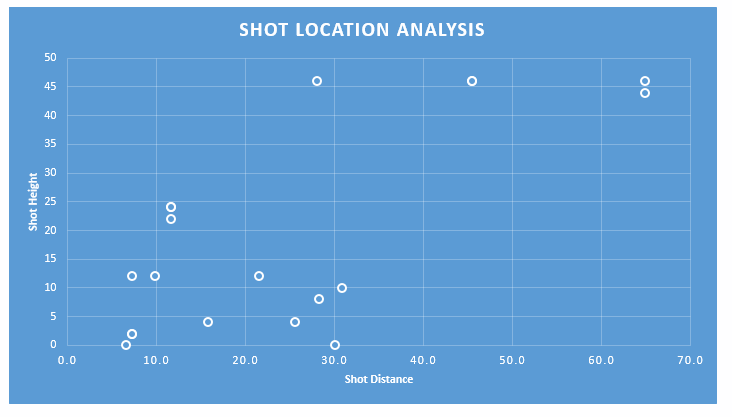 Below we visualize Rebound Control vs Save Percentage by Originating Shot Location and display the significance of each shot location by it’s bubble size which is the number of shots faced from that location. The magic quadrant is the upper right hand corner as you can’t get much better than that. You can easily see with one visualization that Goalie 2 can improve rebound control for shots that originate from the left hand side of the slot. 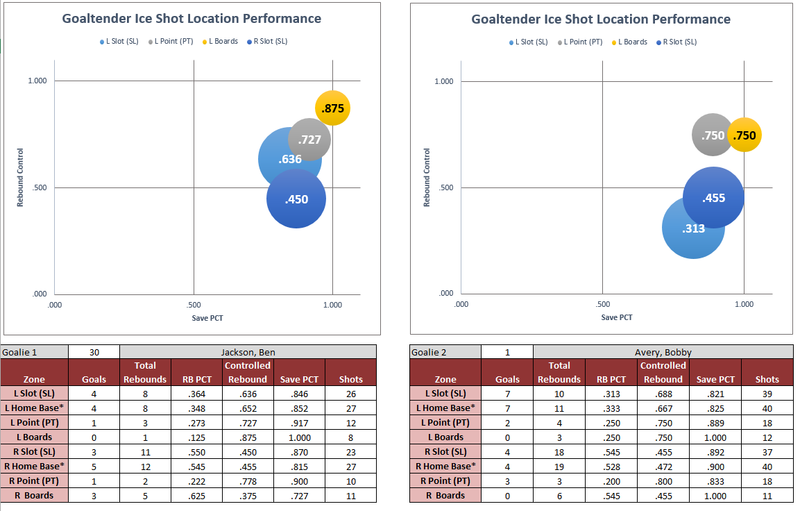 The second chart above shows the Shot Location Analysis which indicates the shot height in inches off the ice, and the shot distance in feet from the net. You can learn more about these products at Colorado Hockey Institute, and thanks for asking the questions.